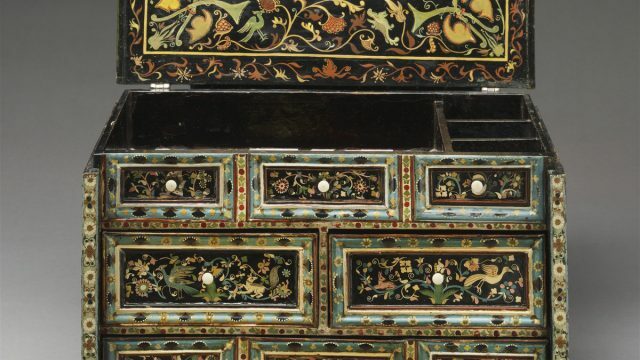 Part of a Conservator’s job is to identify the materials used to create objects. One way of ‘seeing the unseen’ is by using X-radiography, which can reveal some interesting things about an object. X-rays can help to identify the construction, manufacturing techniques and materials of an object, which in turn helps to inform us about what the best course of treatment might be for that object. 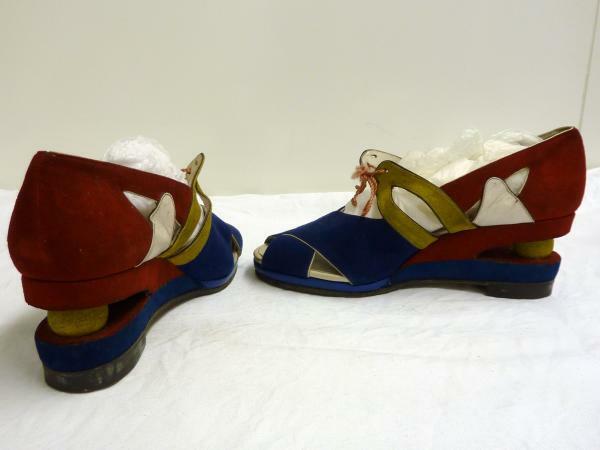 Although we use X-radiography to examine everything from Old Master Paintings to childrens’ teddy bears, for the fashion collection at the V&A, shoes can be particularly interesting to look at. 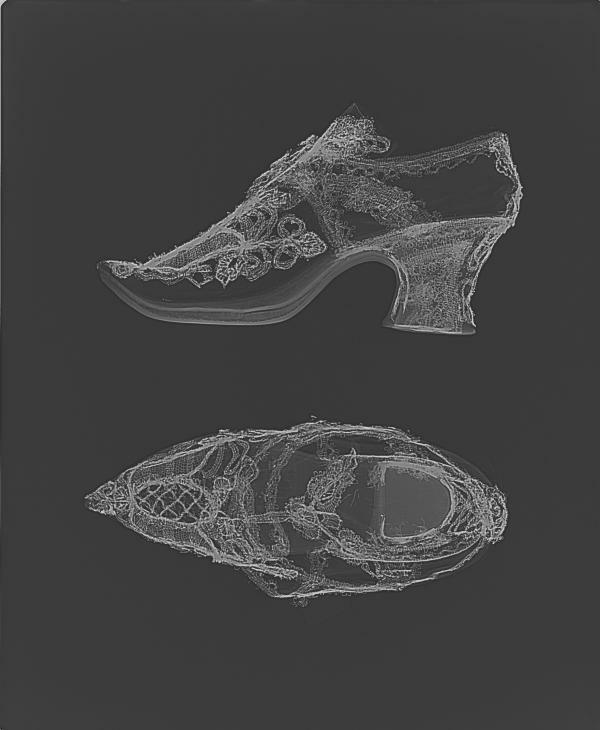 Below are some examples of X-rays of shoes taken recently by Joanne Hackett, Senior Textile Conservator and Paul Robins, photographer. 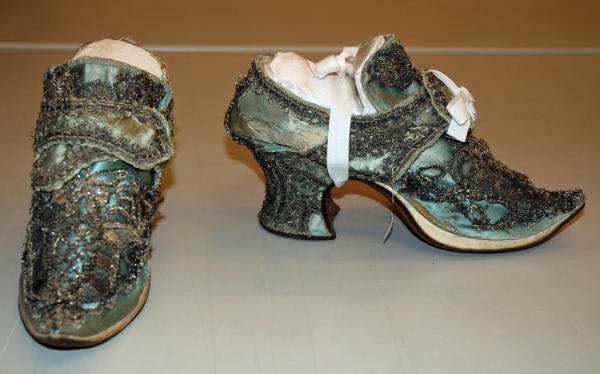 The beautiful embroidered 18th century shoes below have a built-up, platform sole. 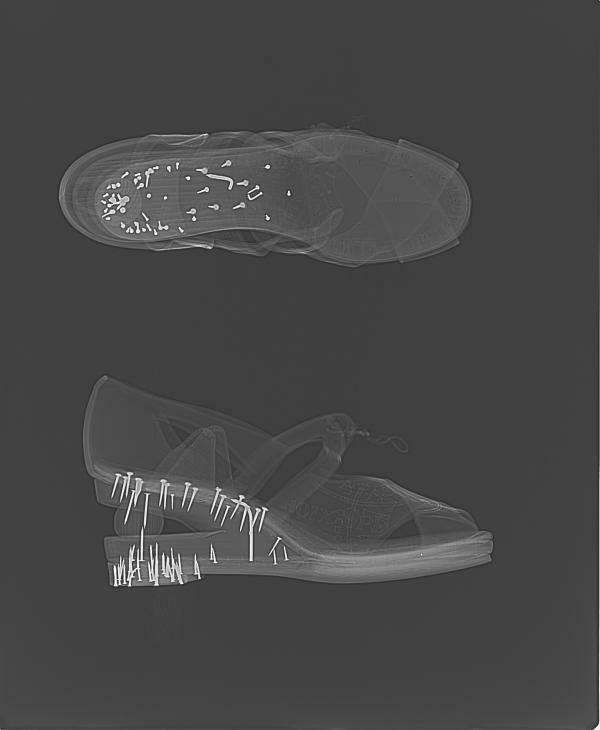 The X-ray reveals that the sole is padded with a soft felt-like material between the layers of leather giving the wearer an extra centimetre of height. 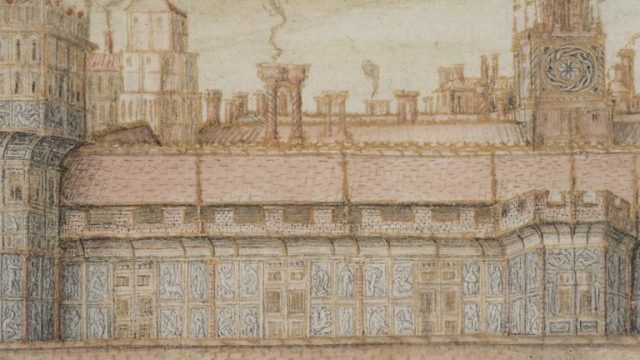 Also, because metal objects are typically opaque to X-rays, in the image we are able to see the extent of the metal thread embroidery much more clearly. 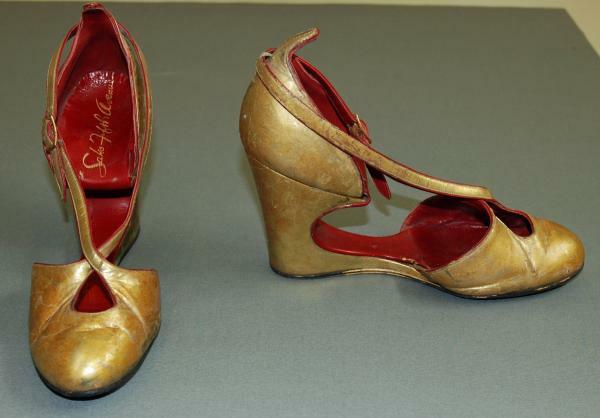 The unusual gold shoes below were designed by Andres Perugia in 1941for Saks Fifth Avenue. They are designed so that there is no physical arch support. 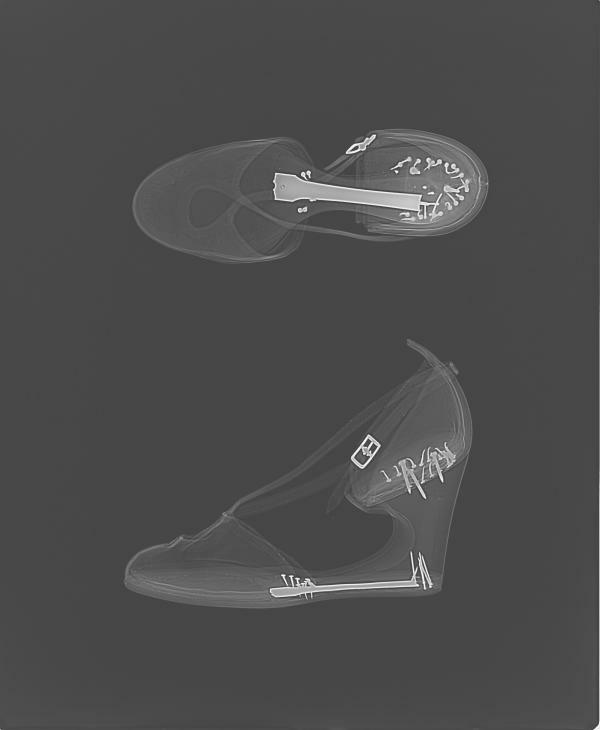 The X-ray shows that the steel shank that would usually run down the arch of the shoe for support has been transferred to the sole. Without this strip of structural steel it’s likely that the shoes would have snapped in two when they were walked in, and so the X-ray image allows us to understand much better how the shoes were designed. This pair belonged to a busy London Socialite in the 1930s. She was known for her love of nightlife, and this probably explains the considerable wear and tear! Before the shoes came into the V&A’s collection, the scuffs had been touched up with gold paint. Before they are displayed, these old ‘retouchings’ will be removed so that they can be studied in a more authentic state. The snappy, multi-coloured, suede shoes below were made in Britain in the 1950s. Wartime rationing was still in place in Britain, and the X-ray shows that the materials used to make them reflect this time of austerity. Not only are the wedges made from wood (probably pine), but the leather lining in the toe area is made not from fine leather, but from leather intended for the insoles of other shoes. The X-ray image also makes it possible to read the maker’s name and the model of the shoe, which have been stamped in gold on the leather. The gold leaf used on the leather is more opaque to X-rays than the surrounding materials, and so again shows as white in the image. Clearly, nothing was wasted when these shoes were made, in keeping with austerity measures of the time. Truly “make do and mend” shoes! These are just a few of the shoes currently being worked on in the textile conservation studio. X-radiography is a great tool to be abe to see inside an object and to give us information about its materials and how it was made. 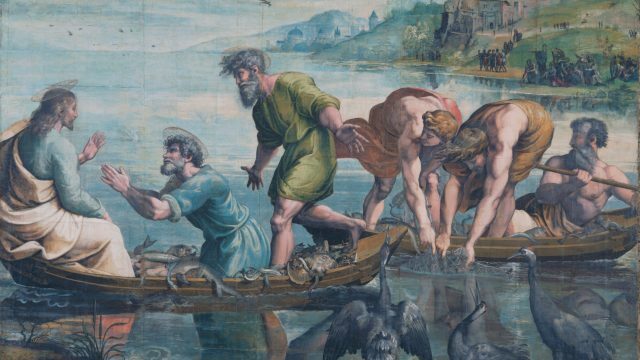 Who would have thought, for example, that so many nails were needed to make a pair of shoes? !